serviceman and discover more about their lives and war records. WHO WERE THE GUILDFORD ANZACS? The Guildford Anzacs project has identified over 700 men and women who served in WW1, from the Honour Rolls and War Memorials in the town and newspapers. Guildford ANZACS Association have built this detailed and dynamic database to help share knowledge about the remarkable lives of the Guildford ANZACS. 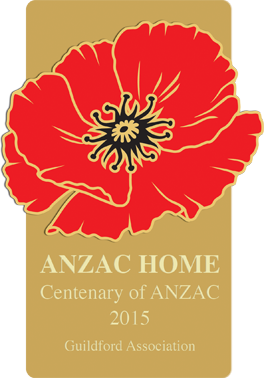 We have identified surviving homes of these Anzacs and marked them with brass poppy plaques. Information on the soldiers that lived in these homes can be found on the website trail map and followed to find out more about each individual. This project gives people the opportunity to walk an historic town and experience the impact of WW1 in each street. AND WHAT IS A GUILDFORD ANZAC? An Anzac home or place of residence in Guildford or South Guildford is the place where a World War 1 soldier or nurse resided prior to embarking for war (1914-18). This may include a home of their childhood or where they boarded for school. It may also include a nominated address of a family member from their attestation papers or a recorded home of their wife or widow up to the end of the war in November 1918. The Guildford Anzacs lived, worked, studied or worshipped in the town of Guildford. Many of these Anzacs who attended Guildford Grammar School had families and homes outside the town and across the State of Western Australia, however, they all made up the complex fabric of social life in Guildford. All these men and women young and older are the Guildford Anzacs.